Designed for optimal care for pregnant and nursing women, this formula delivers research-based multivitamin protection featuring extra iron and 800mcg folic acid. 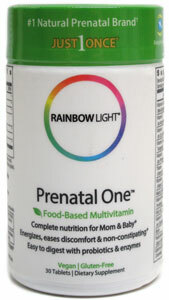 It also contains Rainbow Light’s Gentle Prenatal Blend of nourishing botanicals including fresh ginger juice, and contains 25 million bioactive probiotics per tablet. Gentle on the stomach, safe and natural, this is the vitamin you’ll want to take if you need an exceptional prenatal formula. 30 tablet bottle is $12.99. Gluten Free & Wheat Free. A most excellent prenatal multi! From Christine of SLC, Utah on 2/3/2016 . I took this multi when I was pregnant with my son. My stomach was sensitive throughout that time and these didn't upset it further. It provided everything we both needed! Coupled with as much excellent food as possible, both my son and I were super healthy! I highly recommend the brand and this multi! From Annie of Columbus, Ohio on 6/9/2010 . These are amazing!! They're easy to swallow, are loaded with tons of vitamins to help you and your baby (I love all the vitamin b6 and b12), and I swear this vitamin has even helped my complexion. Don't bother with anything else. It's a 1000 times better than any prescription. Don't bother with any other brand! From Heather of Wilmington, North Carolina on 5/28/2009 . I've used this brand for the past 2.5 years+ religiously (while pregnant/nursing) and have always had great results (no upset stomach!). When having all my nutrient levels tested, everything was as good as they could be (despite not always eating right b/c of being a busy mom).